Faidherbia albida (syn. 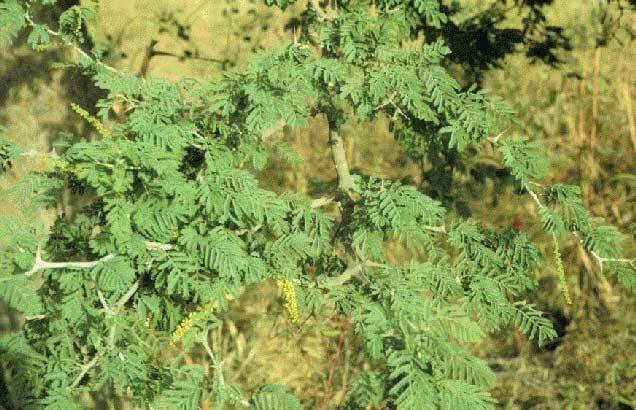 Acacia albida Delile) is a species of Faidherbia native to Africa and the Middle East, formerly widely included in the genus Acacia. It has also been introduced to India and Pakistan. Common names for it include Apple-ring Acacia, Ana Tree and Winter Thorn. It is a thorny tree growing up to 6–30 m tall and 2 m in trunk diameter. Its deep-penetrating tap root makes it highly resistant to drought. The bark is grey, and fissured when old. There are 11000 seeds/kg. Faidherbia albida is not listed as being a threatened species. It grows in areas with 250-600mm/yr. of rain. Faiderbia albida is known in the Bambara language as balanzan, and is the official tree of the city of Segou, on the Niger River in central Mali. According to legend, Segou is home to 4,444 balanzan trees, plus one mysterious "missing tree" the location of which cannot be identified. The northernmost natural populations are found in relict groves in Israel (in the Shimron nature reserve, near the communal settlement of Timrat). All of the trees in a given grove are genetically identical and seem to have multiplied by vegetative reproduction only, for thousands of years. Faidherbia albida is important in the Sahel for raising bees, since its flowers provide bee forage at the close of the rainy season, when most other local plants do not. The seed pods are very important for raising livestock and are used as camel fodder in Nigeria. Its wood is used for canoes, pestles, and for firewood. The wood has a density of about 560 kg/m³ at a water content of 12%. The energy value of the wood as fuel is 19.741 kJ/kg. It is also used for nitrogen fixation, erosion control for crops, for food, drink and medicine. Unlike most other trees, it sheds its leaves in the rainy season; for this reason, it is highly valued in agroforestry as it can grow among field crops without shading them. It contains the psychoactive chemical compound dimethyltryptamine in its leaves. The tree has medicinal value for the treatment of infections such as those of the respiratory kind, also for malaria and fevers. It is useful in treating problems of the digestive system. The bark is employed in dental hygiene and its extract is employed in the treatment of toothache. The extract is also used to treat ocular infections in farm animals. * Edmund G.C.Barrow. 1996. The Drylands of Africa:Local Participation in Tree Management. Initiatives Publishers: Nairobi, Kenya. * C.Michael Hogan, ed. 2010. Faidherbia albida. Encyclopedia of Life. * A.E.G.Storrs. 1979. Know Your Trees: Some Common Trees Found in Zambia. Government Republic of Zambia, Forestry Department: Ndola, Zambia.